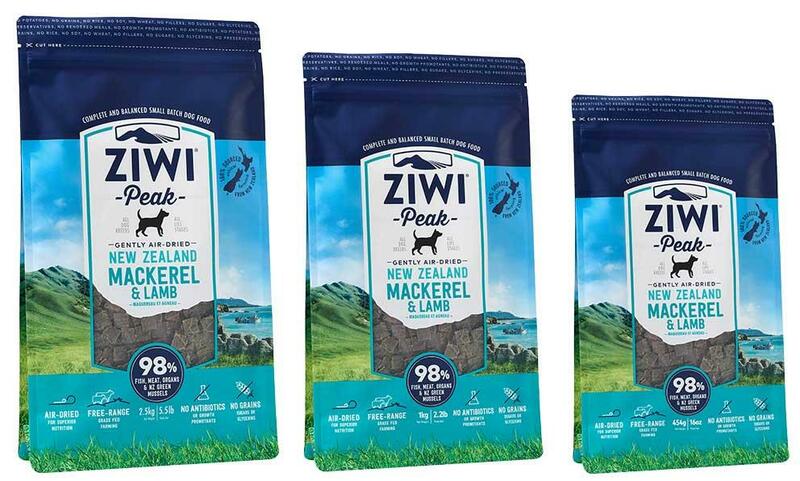 ZIWI Peak Air-Dried Mackerel & Lamb for Dogs. 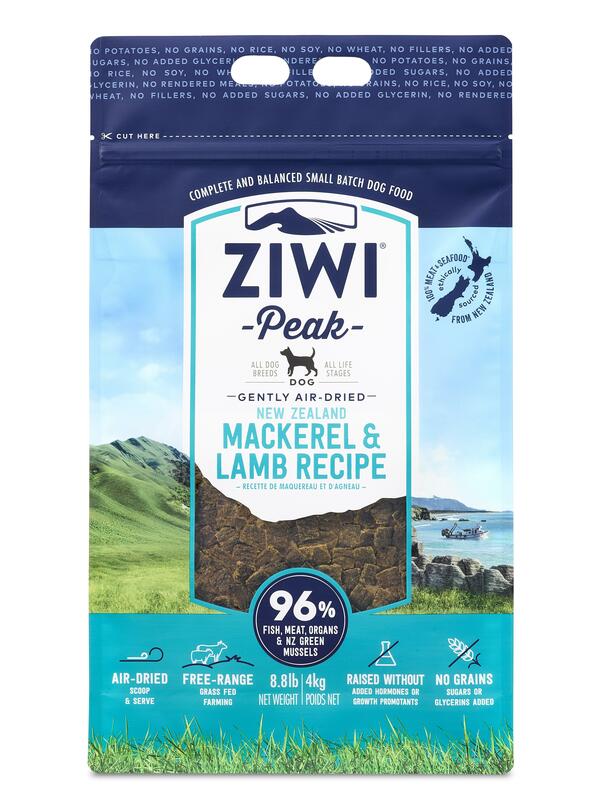 Ziwi Peak Natural Air-Dried Mackerel & Lamb for Dogs. Available in 4 sizes - 454 gram, 1kg, 2.5 kg, and new 4kg pouch. Blue Mackerel is a sustainably-caught fish from the pristine blue waters of New Zealand, rich in Omega 3 and 6 fatty acids, and great for healthy skin and coat. Ziwi Lamb is sourced only from local New Zealand farms, ensuring the animals are free-ranging, grass-fed and grass finished. For the perfect finishing touch, kelp is added as a natural vitamin and mineral source, and New Zealand green mussel for natural glucosamine and chondroitin. Great choice for picky eaters. Mackerel, Lamb, Lamb Heart, Lamb Tripe, Lamb Liver, Lamb Lung, New Zealand Green mussel, Lamb Kidney, Lamb Bone, Lecithin, Inulin from Chicory, Dried Kelp, Minerals (Dipotassium Phosphate, Magnesium Sulfate, Zinc Amino Acid Complex, Copper Amino Acid Complex, Iron Amino Acid Complex, Manganese Amino Acid Complex, Selenium Yeast), Salt, Parsley, Preservative (Citric Acid, Mixed Tocopherols), Vitamins (Vitamin E Supplement, Thiamine Mononitrate, Vitamin D3 Supplement, Folic Acid). 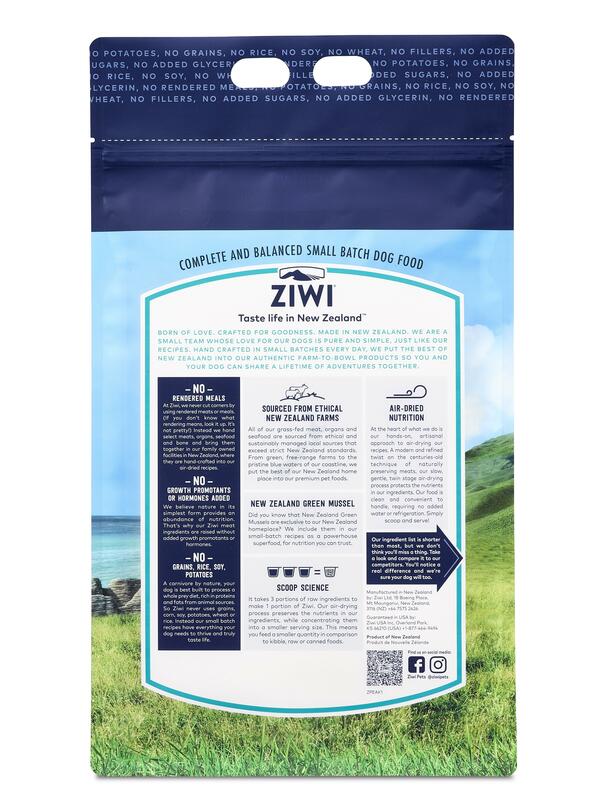 To see other dog food, treats and chews from ZIWI, click here. To see ZIWI's cat range, click here. Rectangular KONG Dog Bed, Red or Black, available in 3 sizes. ZIWI Peak Air-Dried Beef for Dogs, available in 4 pouch sizes. 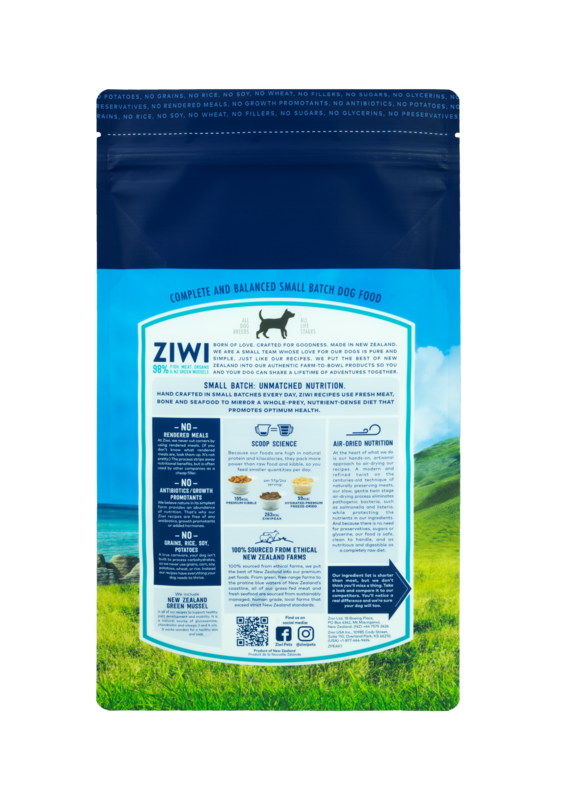 ZIWI Peak Air-Dried Free-Range Chicken for Dogs, available in 4 pouch sizes. ZIWI Peak Air-Dried Lamb for Dogs, available in 4 pouch sizes. Dirty Dog Shammy. BUY NOW and SAVE a further 20%. Dirty Dog Mitt. BUY NOW and SAVE a further 20%. Dog Gone Smart Donut Bed for Dogs, available in 3 sizes and 4 colours. Save $30. Rectangular "Repelz-It" Dog Beds by Dog Gone Smart - Medium size (26 x 34 ins). Save $30. DGS Rubie Roadie round cuddler bed - Ideal for small dogs. X-Large Rectangular SmartBed with Sherpa. End-of-season clearance, SAVE $50.